This month, we were thrilled to announce that we’ve now raised over £17.4 million for life-changing water projects, helping 3.3 million people in the world’s poorest communities. This milestone marks another big step towards our goal of raising £20 million by 2020 for clean water and sanitation projects – but we still have a little way to go! If, like us, you want a world in which everyone has access to clean water, forever, there are 6 ways that you can help us to continue to support the fight to end global water poverty! You can make a real impact, just by switching the brand of water that you buy. Every bottle of One sold funds clean water projects around the world and we achieve this through a guaranteed donation to The One Foundation in every bottle or carton sold. You can find us on Amazon and Aqua Amore online, and in Starbucks and Holland & Barrett on the highstreet. Just by drinking One, you’ll be helping to fund clean water and sanitation projects in some of the world’s poorest communities; there’s something to drink to! When you donate to The One Foundation, your money makes a real, lasting, difference. We’re proud to focus on a systems-led approach to water aid; focusing on holistic programmes that fund sustainable water solutions to support communities in need so that they have clean water, forever. 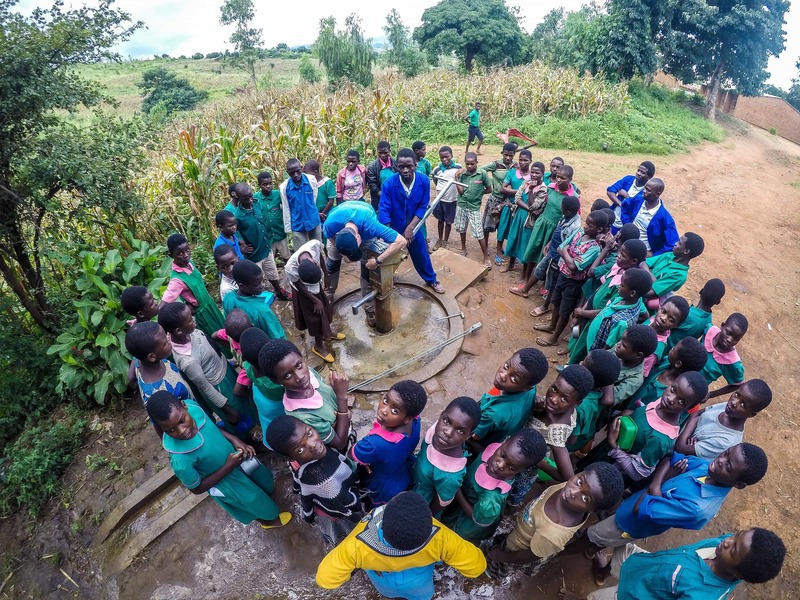 As well as drilling new boreholes, constructing wells and repairing faulty water pumps, we also train communities in the maintenance and repair of their water points and provide education on good hygiene practices to ensure we achieve lasting change. Next time you’re in your local coffee shop or eating out at a restaurant, ask if they would consider switching their water, drinks (or even gin!) to an ethical brand, like One. We work with a number of cafes, shops and restaurants including Cook, Sourced Market and Hawksmoor – in fact, Hawksmoor were involved in the design of our glass ‘butterfly’ bottle range, which look particularly beautiful in a restaurant setting (available in 330ml and 750ml). Planning your next challenge? Walk, run, cycle, bake…(you get the idea!) for clean water! Raise money for The One Foundation by setting up a profile on Just Giving and sharing your fundraising journey with your friends. Some of our challenge ideas include the 5 litre challenge (challenge yourself to live on just 5 litres of water a day) or our One Big Walk challenge (a 100km walk for water), but we’ve had people climb mountains and live ‘the Malawi way for a day’ for us in the past too! Whatever the challenge, we’re always so inspired by our fundraisers. Consider switching to Amazon Smile when you shop through Amazon – and choose The One Foundation as your chosen charity to support. It’s the same shopping experience for you, but every time you shop through Smile, Amazon will donate 0.5% of your total spend to us at no extra cost to you. Simply bookmark Smile and make a habit of shopping through smile.amazon.co.uk instead of amazon.co.uk. A simple switch that can help change lives. Unfortunately Smile is not currently available through the Amazon app, but you can place everything in your basket there and complete your transaction through Smile on your internet browser (it remembers your basket!). Ready, steady, shop! You can show your support by following us on Facebook, Twitter, Instagram and by signing up to receive our monthly e-newsletters direct to your inbox each month. We post all our news there first, so you’ll always be the first to hear our latest project updates and fundraising milestones. A like, comment, RT or share with your friends and followers goes a long way and as a small charity doing BIG things, we appreciate every follow and interaction with our posts!